Firstly, apologies as the weather has delayed our February newsletter into March! The cold snap has also wreaked havoc with frozen pipes and snow damage to our ceiling in the studio and spin room so thank you for bearing with us during this period of disruption. We are hopeful that we will be back to normal very soon but, in the meantime, please keep an eye on facebook for updates. 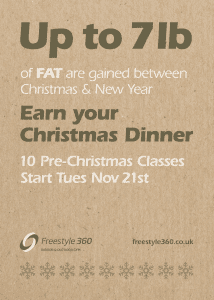 Don’t forget our new year offer is still available! Sign up to gym membership any time before the 31st March and we will give you one month free with no joining fee. Terms and conditions apply. We have some exciting events planned which you will not want to miss! Apr 15 360 Cycle Sportive – details to be announced soon! Jun 27 Pyrenees Cycle Tour – details to be announced soon! We also arrange bespoke trips for corporate groups, family and friends. 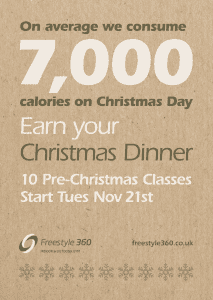 Please emailtim@freestyle360.co.uk for more information. As you may be aware we are introducing our new 360 app which will allow us (and you!) far greater functionality. Whilst the app is available now, it is in final testing so please bear with us as we iron out any issues. We will let you know as soon as the app is ready to go live. In the meantime, we are in the process of migrating existing members to the new system so you may receive a phonecall from us in the near future. We are now taking bookings for our Easter Kids Camp running from April 9th to the 11th 9am to 3.30pm. At just £30 per day per child, activities include indoor and outdoor games and of course our infamous mud run. 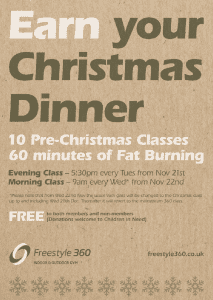 Email rachel@freestyle360.co.uk to book or for more information. Places are limited. Do let us know if you have been up to anything recently or have any events coming up. Claire Shaw who is in training for a 2019 Polar Expedition to the Northern Pole of Inaccessibility which is the centre of the Arctic Ocean, the furthest point from land. If Claire makes it all the way across the sea ice it will be a world first! Super impressive stuff Claire. Viv D’Alton completing the Thames trot 50 miles, her toughest challenge to date. Lastly, if you have any feedback, comments or suggestions we would love to hear from you. 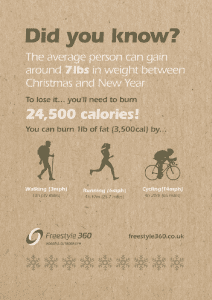 Just email us at info@freestyle360.co.uk. Christmas really is less than 6 weeks away! There have been a few articles in the Sunday papers lately about how it has become the norm to over-indulge during the festive period then hit it hard in January (when the gym has a queue 3 deep for the treadmills!). Here at 360 we are pre-empting this and suggesting a different approach. Why not train hard in the run up to Christmas and you can sit at the table on Christmas Day all smug in the knowledge that you have jolly well earned your dinner with all the trimmings! You will no doubt notice a few changes to the gym over the coming months as we embrace our new ‘Back to Basics’ campaign. We have now been open for almost three years and in that time have been continually updating the gym, equipment, classes, outdoor obstacle area, building a new shower block and changing room. Additionally we have vastly expanded our membership and increased the number of events and trips we run. We have plenty more ideas and expansion plans for the future but before we pursue those, we are taking some time to listen to you and what you want from your gym. We value your feedback and communication from our recent Focus Groups indicated that you want us to concentrate on perfecting the basics, ensuring that the gym is current and our staff are consistently training you well. We are also investing in a new and very exciting member management system which has so many possibilities. More information will be given in due course so do keep your eye out for future communications! Sadly, due to low numbers Yoga will no longer be running. However we have launched a new Stretch and Mobility Class at 6.30pm on Thursdays, free to members, £7.50 non-members but your first class is free so do give it a try! Steve Batsford for completing his first 100 mile (yes that is correct!) Ultra Event at Robin Hood in a phenominal 20 hours 49 minutes! Jemma King adding to her medal collection with successful runs at the Ilmington 10k and Rugby Half marathon. Susan Hunt for completing the MBNA Chester marathon and the Ilmington 10k. And last but by no means least Viv D’Alton for also completing the Ilmington 10k. Do let us know if you have been up to anything recently or have any events coming up as we would love to give you a shout out.